In a move designed to bolster the bullpen, the Mets have signed reliever Matt Wise to a very cheap, one-year, $1.25M deal. Though I’m 100 percent behind this pickup, it’s kind of disappointing to consider that this is one of the most exciting moves of the offseason. Wise is more or less guaranteed some type of role in Willie Randolph’s bullpen, and has been successful as a setup man in the past. He’s coming off a down year but hopefully is due for an “up” year in 2008. My guess is that he may be used similarly to the way Randolph used Chad Bradford two years ago — in any inning from the fifth through extras. Whether he’ll be as effective is another question, however. The signing of Wise closes a big hole in the Mets’ pen left behind by Bradford after the 2006 season — innings that weren’t well-filled by Guillermo Mota and Scott Schoeneweis, among others. Wise also provides some insurance in the event that the recuperating Duaner Sanchez either does not come back healthy or does not receive a belly buster DVD for Christmas (see right). Wise is a tall and slender (6’4″, 195 lb.) rubber-armed reliever who throws a four-seam fastball, overhand curve, and changeup. He generally doesn’t give up many homeruns, and limits his walks. When he struggles, it’s usually due to losing his confidence and aiming the ball. 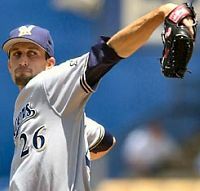 His strikeout rate has been sporadic from year to year; in 2001 and 2005 he averaged a strikeout per inning but only struck out 27 in 44 innings in 2006. Last year, he K’d 43 in 54 innings, but posted a 4.19 ERA and a career high 1.45 WHIP. Compare that to his career WHIP of 1.26 and his ’05 WHIP of 0.96 and you may begin to understand why the Brewers non-tendered him — he appears to be on the downside of his career and through arbitration they would have had to pay him for his good years. It doesn’t help that Wise missed significant time in 2006 due to an elbow injury — so that could have something to do with his downfall. From the Mets’ point of view, though, this move is a no-brainer — he comes ultra-cheap in this market, with only a one-year commitment, and there’s a good chance he’ll be at least better than Mota was in ’07. Now, if only Duaner Sanchez can get his arm in shape — and stay away from the beers and the Big Macs — the Mets’ bullpen might be a strength again in 2008. Doesn’t this also make Heilman expendable? As in, the signing makes Heilman the odd man out in the pen . . . ? I’ve read similar posts on metsblog and I’m not understanding the mentality. If nothing else, Wise replaces Mota from 2007. Heilman is still the setup man. We have to go into 2008 thinking we are to get nothing from Sanchez. Because if we trade Heilman, and Duaner is unable to come back as strong as he was in 2006, the bullpen is screwed. Even in Wise’s best years (which are 3 seasons ago at this point), he still wasn’t as good as Heilman is now. Unless for Johan, DO NOT TRADE HEILMAN. In roaming around the net tonight, I can see why Wise was brought in — take a look-see! Looks like Duanerâ€™s back and rehabbing, though it doesnâ€™t look like heâ€™s laid off the beer or burgers much during his extended absence. Thereâ€™s no reason for anyone to be penciling him in the bullpen with any surety right now â€” especially given his rehab history. Hopefully, any moves Omar makes going forward involving giving up bullpen pieces â€” is with this in mind. And really, it might give us some insight as to why Matt Wise has been brought in â€” moreso than any pending trade of Aaron Heilman. Joking aside, I wish Mr. Sanchez all the best in his return to the rubber. It will only be to our benefit if he comes back in peak form â€” however, as Iâ€™ve maintained in monitoring his work ethic for a year and a half now â€” Iâ€™m not holding my breath in those hopes. No one should be counting on him at this point. ID, I was just suggesting it. Unless it’s for Joahn or Erik Bedard, I want to see Heilman in orange-and-blue next year. Im hoping we see some action from Omar very soon. Adding Wise was a wise move[someone had to say it]! There is some more work to be done. If im Omar, and thank god im not, Im burning up the phones to get some deals done. 2-Hendrickson-can be short + long reliever, and start as needed. LAD used him well last year, and he was very good. Exactly what we need! 3-C Wilson-perfect add to the bench. Can play 1b/OF/C…good all around player, can be right handed counterpart to church. We need that type of utility guy. Allows fleubility to get Castro some PH appearances too. 4-Dotel or Otsuka-proven setup/closer types just waiting for the taking, on the cheap. I love dotel, for nostalgia. Otsuka has been lights out, and would be amazing, depending on his medical records. 5-De Nardo-solid back end starter for the A’s last year. Would be a nice pick up for AAA as a backup. IMO…..Sorry, FMart SHOULD be untouchible. He is seen as THAT type of special player, and projects WAY too high to give up on. To a slightly lesser extent….you avoid trading Mulvey. In 6mo time, he went from a projected backend SP, to a high ceiling front end caliber, at least thats what the scouts say. It tough to give up when they are a year away. Also, Rustich, ive seen him, and he has filthy stuff. Converted from SP so he can move fast to the pro’s, probably bc of the long line ahead of him. Im hoping they switch him back if we do make a trade. Trading these 3 should be avoided at all costs. That being said….I think we match up well in a trade with the Twins, and possibly the A’s. I would give the twins what they want, except for Fmart, to get Santana. We have to keep atleast 1 of the top 4 SP in the system, and they can have what they want. For Blanton…I hold my chips for a big deal, trying to center it around guys like chavez, church, and/or gotay, plus prospects. We need to hold Gomez for a move for an ace, unless it makes it a smaller package[ie gomez + heilman]. Happy hunting Omar! Your off to a good start, but we need a big finish here to get the missing parts we need. I like these suggestions … Prior, Colon, Hendrickson, Wilson, Dotel, DiNardo — they all make sense. However I doubt the Mets would be that active with signing free agents. My guess is if we’re lucky they’ll sign one of these guys. I’m really surprised Omar hasn’t jumped all over Colon — he would appear to be an “Omar guy”. 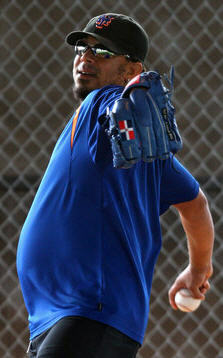 Maybe he’s worried about Bartolo’s bulging waistline? Joe, I totally agree. I know they wont be that active. But I would hope that Omar is looking at those options. Thats really more of what I would do, not what Omar will do. Omar isnt know for making drastic changes. *No trades-prob sign colon or prior to incentive deals and poss 1 more RP[dotel] to cover all bases. Im thinking that Omar would consider moving sosa to AAA if needed, and finding a SP with “ace potential” to take a spot, while letting the kids get seasoned in AAA. The big question is, DID OMAR LEARN ANYTHING FROM LAST YEAR??!?!?!!? Last season, he put all his eggs in Zito’s basket, while losing out on possible back end starters. This season could be more of the same, unless he really believes he is in the game to trade for a SP, while having a good option in his back pocket[hopefully not named livan]. I liked silva, so thats 1 down. I would rather Livan than loshe, but thats not saying much. Hopefully last year doesnt repeat itself. That in itself could punch his ticket out of here. You cant hold your breath blindly, you need to know how good your fallback options are, and when to go to them. Last year he lost…. Having lost Lastings I would not part with Gomez or Fmart except for a known front line ace. I am hesitant to cripple the organization for a player who could well have injury issues. Pedrom cost us a pick…at worst. I also think Lohse, Silva, et al are hardly upgrades to Glavine. As it is We HAVE Ollie, Pedro, and Maine. Then El Duque, Mulvey, Humber, Pelfrey in the mix. I’d like to offer Bartolo a chance and pencil El duque as a #5/#6 (the role Walnut has for Hendrickson). I was very brutal about Pelfrey last yr, but for some reason I think he might evolve this yr into a .500 level starter. Bartolo could be a high return- high risk investment but if it works out could be the last ingredient we need. Pelfrey, Mulvey and Humber could net those innings we need. Hopefully the late season Pelfrey will show up. Gomez represents a superior defender who can possibly mature into a plus hitter. With Wise and hopefully Duaner to back Heilman, Smith and Wags we should be ok. Plus the Phillies rotation could be the worst in baseball. Buster Olney of ESPN is saying that the A’s would trade Joe Blanton for Gomez, Heilman, and Kevin Mulvey. Not sure if I’d do that one–the first two, maybe, but not Mulvey. That’s not a trade this team can afford to make, at this moment in time. That’s too much for Joe Blanton, IMHO. And I’d be curious as to who Buster “Can’t Get Right” Olney heard talking that one over. Olney has rarely ever passed along a useful nugget of info — and believe me, I’d love to add Blanton (inning eater, solid middle of the rotation guy) — but not at that price. Mulvey may be just as good in a couple of seasons. Heilman would create another big hole in that pen, and Gomez would just be gravy for Beane. 7 innings out of Blanton wouldn’t mean a thing if the bullpen didn’t hold from there on out. And Heilman’s a huge part of that equation. I agree with Walnutz. As I’ve been saying all along, Heilman’s worth to this team is immense right now with Sanchez still on the road to recovery. It’d be a quick-fix move to ship him out with some prospects to land Blanton or Bedard, but Walnutz is totally right, after their 7 innings, how fast will we get sick of watching Wise or Feliciano or Dotel blow games in the 8th? Actually, with Wise’s addition I’m not sure if anymore relievers are needed (unless signed to minor league deals). The core of Wagner, Heilman, Wise, Feliciano is very solid, with Sosa, Schoeneweis, Smith, Collazo, and Muniz as compliments to work mop-up or as specialists. Then we still have Sanchez on the mend and guys like Kunz. Raustich, Schmoll, and Camacho not far off. Why guarantee a roster spot to such question marks as Dotel/Otsuka/Hendrickson who are very likely to get hurt or underachieve while clogging spots for guys with minor league options. Where is Skibolton when you need him? DiNardo is not available. Rotoworld reports he was signed to a 1-year deal with Oakland on Dec. 12. It would also be bad to sign both Colon and Prior. Both will command major league deals, so you’ll have to carry each at the expense of Pelfrey and a reliever, which then bumps El Duque to full-time reliever/spot-starter role, which he is unfamiliar with. Additionally, neither Colon nor Prior have done anything useful over the past 2 years that would suggest they could win 15+ games in 2008 or be deserving of 2-year contracts. Their additions would only clog the paths for guys who have futures, like Kunz, Rustich, Smith, Vineyard, Humber, Pelfrey, and Mulvey. I’d have no problem giving Colon or Prior minor league deals, but no way anything that assures them a spot on the 25-man roster. I’d also pick signing Kevin Mench or Shannon Stewart over Craig Wilson for our final bench spot. I do agree with you, though, in that F-Mart should be as close to untouchable as possible, and that guys like Lohse and Livan should not be pursued by Omar unless on 1-year deals. On the subject of gambling on starting pitchers, I think I’m becoming more of a fan of Freddy Garcia. He’ll likely be out until August after undergoing torn labrum surgery last year (same as Pedro), but Pedro hasn’t shown many ill-effects yet, so that bodes well. Garcia would also be very inclined to sign a minor league deal, as he’ll miss more than half the season while recovering. Before getting hurt, Garcia was as much the innings-eater as we need: 6 straight seasons of 200+ innings pitched, with respectable ERA and WHIP numbers while pitching in the AL. He could be a nice pick-me-up when El Duque suffers his obligatory season-ending injury in August, and might consider re-signing as a Met if he performs well enough to deserve a contract offer when he returns from surgery. As much as Blanton would seem to be ideal for the Mets, being a good ERA[in the AL], innings eater…. 1-Is he worth heilman, gomez, + mulvey? 1b- if he is worth all that….then is it worth doing considering any hope of getting santana diappears when mulvey and gomez go? 2-Just how good can Gomez be? Is he worth trading if he will be the stud that some project? or does he remind you of Escobar? 3-does anyone believe that church was acquired to be flipped? He seems like the ideal player for a small market team [high OPS, good D, low salary, control for 4 years]. Is he a Beane type of guy? Would you flip him in a package for Blanton? Would Beane? 4-Is it just me, or does the Mets problem resemble the addage “what came 1st, the chicken, or the egg?”….what is wrong with the Mets pitching, SP not getting through the 6th OR the BP not finishing games off? Which is it? Me….dont trade gomez unless its for santana. blanton would be nice, but Beane wont trade with the Mets unless Omar surrenders his 1st born. I can only hope that church can be flipped to get a SP…i like him, but lets get real. SP is more important than BP, especially given the shelife of RP, our RP depth in AAA, & the depth in FA, Heilman is great, but is our best expendible trading asset. Heilman can be replaced, just not in Izu’s heart. – why trade Heilman ++ for Blanton? is there any reason to believe Heilman wouldn’t be at least as valuable as Blanton in a starting role? If we don’t need him in the ‘pen, make him a starter — don’t trade him for a middle of the rotation guy. jk izu….i have been in support of that guy since they drafted him. Im glad someone else has his back. I say This is solely because I believe that if we can get 5 guys to go 6-7 solid, regularly…it will be better than a 5 starter getting knocked around, like the last 2 years[i still have nightmares about Lima], and taxing the bullpen. We already have 2-3 setup guys in feliciano, wise, and sanchez. Including otsuka/dotel/cotts, who we would need to add to replace heilman. again….i just see it differently. But i can dream, cant I?